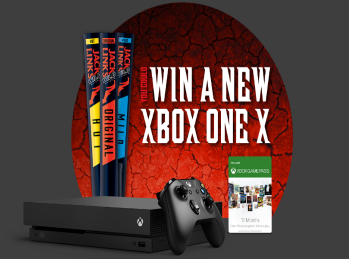 Jack Link’s® Wild Xbox Instant Win Game – Win an Xbox One X & more! Win an Xbox One X and a 1 year Xbox Game Pass Memebership (10 winners)! ENTER SWEEPSTAKES HERE – Jack Links Sweepstakes page. ENTRY LIMIT – Limit one (1) entry per person and/or per email address per day. ELIGIBILITY – Open only to legal United States residents residing in the fifty (50) United States and District of Columbia who are eighteen (18) years of age or older. SWEEPSTAKES ENTRY PERIOD – The Jack Link’s® Wild Xbox Promotion begins on 11/7/17 at 12:00:00 AM Eastern Time (“ET”) and ends on 3/31/18 at 11:59:59 PM (ET). PRIZES – Ten (10) Grand Prizes are available. Each Grand Prize consists of an Xbox One X game console and a one (1) year Xbox Game Pass Membership. The approximate retail value (“ARV”) of each Grand Prize is $619. Seven Hundred (700) First Prizes are available. Each First Prize consists of a one (1) month Xbox Game Pass Membership. The ARV of each First Prize is $9.99. Two Thousand (2,000) Second Prizes are available. Each Second Prize consists of a five (5) day Xbox Game Pass Membership. The ARV of each Second Prize is $1.60.